When other motorcycle manufacturers noticed a gap in their lineups, they fired up their R&D machine and developed a motorcycle to fill the gap. In Kawasaki and Suzuki recently entered into a sort of partnership to flesh out these gaps in their lineups without tiring out their R&D departments or draining the budget. 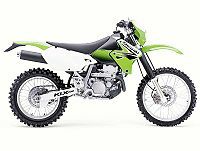 They agreed to share certain models and, voila, a green DR-Z400 rebadged as a KLX400. Of course, Suzuki has the DR-Z400 in kickstart and electric-start flavors, while the KLX comes only with electric start.